First and foremost, the game is a collector’s dream, there are a ton of cards separated into eight different booster packs, which you win by dueling different players in all kinds of environments. I’m a bit soured by the fact that you don’t have a master list of all cards anywhere, you don’t know if you have all the cards you can get from a specific booster, there’s no checklist. At first I just dueled the same guy over and over to see if there were any new cards I could get, but that got boring quick. Why not tell me there are X more cards I can get from a specific booster? 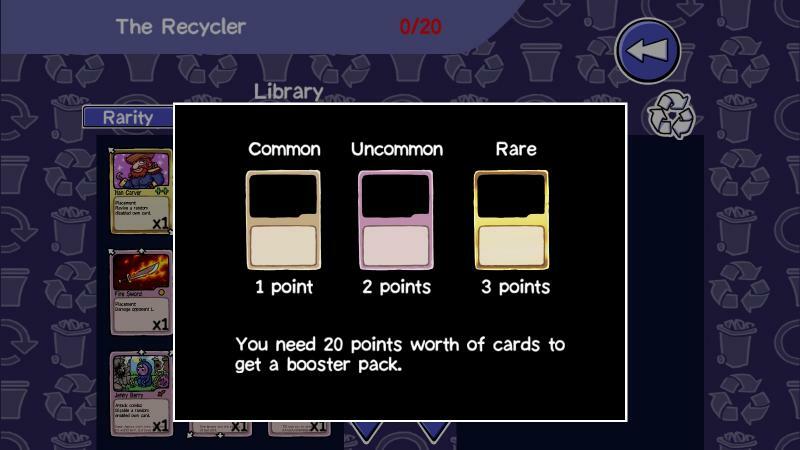 The fact that you can recycle cards for more boosters is nice, but doesn’t help me with my need to get them all. 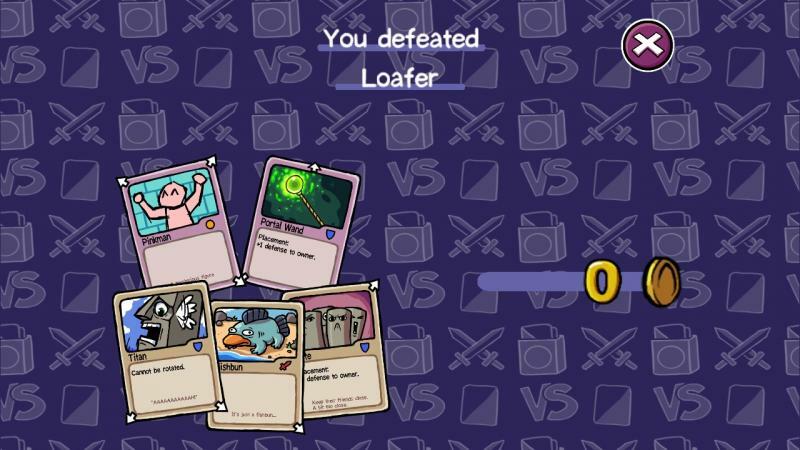 The game itself is pretty interesting, you can win by reducing your oponent’s defense to 0 and you can lose by being unable to place a card at the beginning of your turn. The game is played on a 3x3 grid and you place cards with arrows on them. When you match 3 symbols on any cards linked by arrows, they do something and then disapear. Cards are split between offense, defense, healing and neutral. You can attack the opponent’s cards or their hit points directly, which I almost always did. Your opponents start with weird decks where they’ll often lose by running out of space to place their cards, but as you go on, they turn into incredible matching machines. It’s always a valid question in such games, is the computer cheating? Probably not, but it’s certainly making better-balanced decks than I am, and I wish the game would give you tips about deck building. And that’s why I didn’t have the best experience with CCN. Either the opponent was pathetically easy to beat, or I was frustrated and unable to beat them.Overly aggressive enemies that disable my cards and leave me losing to a full board, enemies that just pump up their defences forever - and I had to make a huge deck just to win by them not having any more cards to play - or enemies with weird spinning and moving around rocket cats. It’s a fine game to be sure, but losing repeatedly even by making changes with the cards I had wasn’t the funniest thing in the world. Still, I had some good time with CCN, for a while.